Last fall I became a Gelli printmaking addict. For those who haven’t discovered it yet, the Gelli Arts Plate is a permanent “gelatin” plate that allows you to do monoprinting without a press. To see what that involves, check out the GelliArts website at gelliarts.com for a FAQ and video demos. To me, it’s a natural idea to put children and gelli printing together. The only thing that concerned me was using acrylic paint. You can buy nontoxic pigments, of course, but it’s difficult to get out of clothes. You can actually use almost any kind of paint or ink with the plate, so I decided to experiment with tempera paint, which is nontoxic and can be washed out of clothes, although some colors do stain. Every year artists from the Irving Art Association participate in a Christmas Card Workshops series held during the Holiday Open House at the Irving Arts Center. We help young children create cards by providing stamps and art materials, as well as such art activities as doing face painting, assisting with Spin Art, doing name calligraphy, creating “Santa Portraits”, etc. 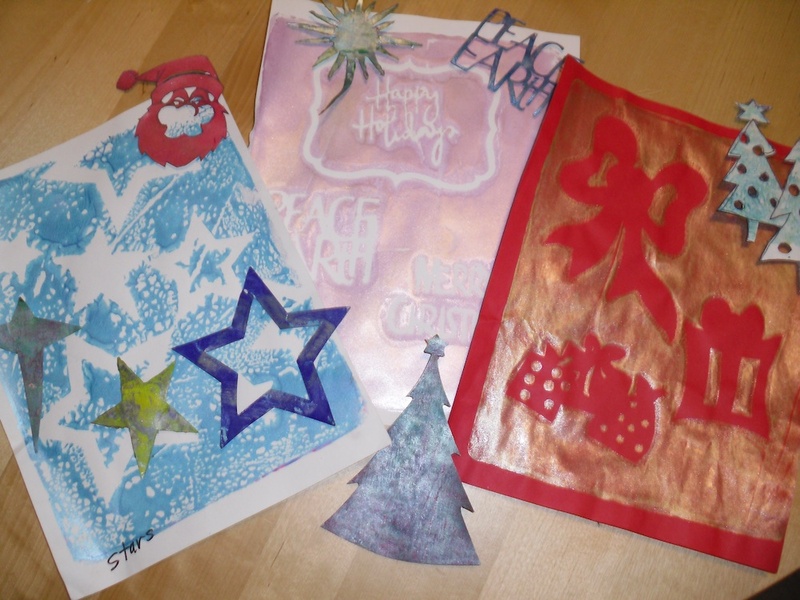 I envisioned the children creating holiday art with the Gelli plate. I looked at finding holiday-theme stencils to work with, but decided to make my own cut-outs to work as masks to save money. I made them out of cardstock, but next year I’ll spring for some plastic stencils and make my masks out of sturdier materials. I did buy some cheap die-cuts through Etsy with holiday sayings to expand the offerings. I went for simple holiday shapes like stars (both five-pointed and Christmas beacon), holly, Christmas trees, presents with bows, and ornaments. Also, some more complex ones like snowflakes, Santas and reindeer — a number of these were torn or fell apart. Since Irving is very multi-cultural, I also included Hanukah and Kwanzaa themes also. Rather than have children sorting through the fragile masks, I made prints of the all designs and put them into a design book where they could pick out those they wanted. So while I was assisting one child in printmaking, another could be deciding what designs they wanted. Doing the printmaking with the children was an enjoyable (and manageable) one-on-one process. First I asked them which designs they wanted, what colors to use, and what paper. I had the basic holiday colors: red, green, blue, white, black, purple, and even turquoise. Also metallics in many colors (very popular choice!) For paper we had white or off-white cardstock and red or green colored paper. The Gelli plate that I used was the medium sized 8×10 and the paper, letter sized. To avoid messes and the use of too much paint, I squeezed the small amount of paint required onto the plate, positioned the brayer and had the child roll out the paint and cover the plate. Then I asked them where on the plate they wanted the designs placed. If the child was preschool, I placed the masks for them. If older, they did it themselves. (And sometimes had to do it over, if they didn’t listen to the warning not to move the design after it was placed.) When everything was ready, I covered the plate with the paper and demonstrated how to rub it to take the print. Then I removed the paper from the plate and showed them the result. I loved watching the faces of the young artist and their parents light up when they saw the art they’d created. Sort of like doing a magic trick! I do hope that the children didn’t feel that the process was too controlled, but they all seemed to have a good time, plus we didn’t have any clothing casualties. I am not experienced at handling a mass of children, so this individual interaction worked great for me. And I had a really good time! The last step was to put their art on a table to dry — usually for 5 to 10 minutes. If too much paint was used, it could take a half hour or more to dry and was usually forgotten. Next year I hope to have an additional plate and volunteer to work with me during the Holiday Open House. There was always a line of kids wanting to do gelli printing! I have since worked with the gelli plate and tempera in printmaking at an art reception at the West Irving Library. For this I used plastic stencils and stamps. Both children and adults played at printmaking.